We bought tickets ages ago to see a Fleetwood Mac tribute band (Fleetwood Bac by name) down at the Minack Theatre, which is a cliff-side theatre down at the far West end of Cornwall. Yesterday lunchtime, as the cold rain sleeted down and the wind wailed, this felt like a really bad idea. But the Minack seemed to think that things were not quite so awful at their end of the county, although the rain splodges on the webcam were not encouraging. So, we (chainmailmaiden, pwibethran, pp and me) gritted our teeth, resolved to be British and Not Put Off By a Spot of Rain, and set off. It poured with rain as we crawled through the roadworks over Bodmin moor under dark grey skies, with the headlights lit and windscreen wipers on full. But there was a faint light along the Western horizon, so we went on. Soon there was a handkerchief of blue hanging over the many white whirling wind turbines of the West, and then more than a handkerchief. We were undertaken by an appalling rider of a motorbike, who seemed determined to cause an accident, either by maniac riding, or by the enormous acreage of pink bum cleavage that he waved triumphantly at us as he shot past. The day was looking up. And when we got to Porthcurnow, the sun was out and the sea a wonderful blue. We parked and went to the pub, where we sat outside under blue skies (everyone else was huddled in the bar) and had a meal. Then we went to the beach. There were bluebells and white three-cornered leek flowers everywhere. Hurray, we thought, and went up the steep steps you can just see in the middle of this photo. There is another more obvious route of course, but why would you go up the road when you could risk life and limb on narrow granite steps with a fabulous view? 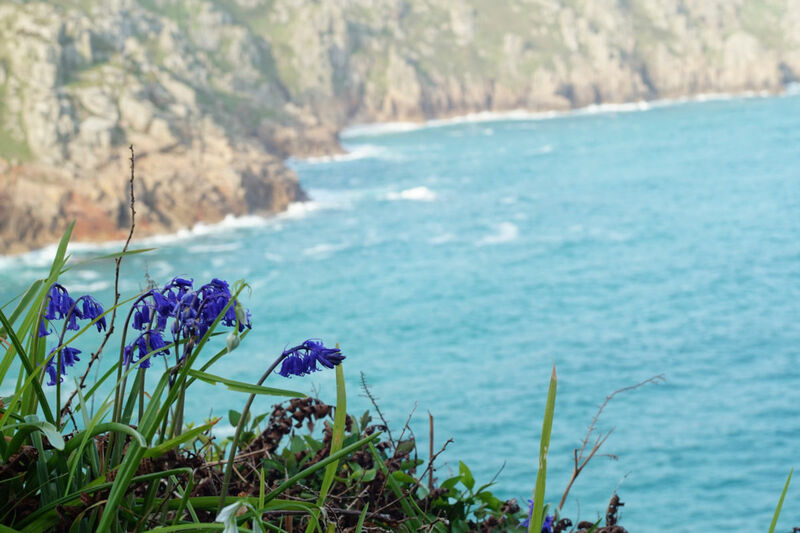 There were bluebells posing on the edge of the sea. I loitered and took photos. When we got to the top, there was already a huge queue. 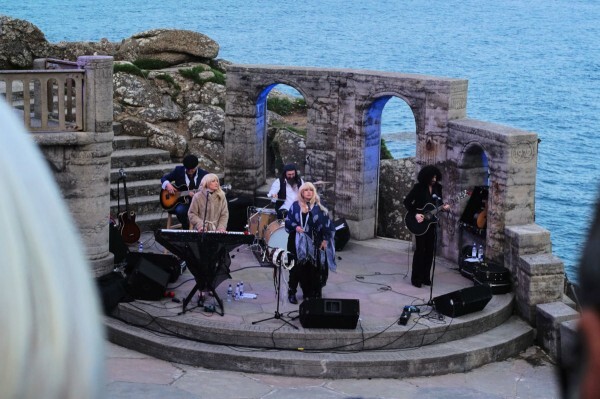 People turn up early to go the Minack, it seems, but all the same, we ended up with an excellent perch on the rocky steps, and had brought sufficient blankets and fleeces that it was not too cold. The band were pretty good too. I didn't want to spoil the performance with camera-fiddlings, but I did take one photo when things were just getting going. All of them were good musicians who played their roles well, but the Stevie Nicks and Lindsey Buckingham players I thought were particularly good: her for the voice, and him for the mannerisms, although his voice wasn't quite so strong. On the way home, we met a hedgehog on the road. It's years since I saw a hedgehog, and fortunately Pp saw it in time and took evasive action. Home through the night, with Pp driving in a cautious and hedgehog friendly manner through the dark and empty lanes. Those photos are spectacular. Looks like a wonderful experience. The photos don't do justice to the view, really - I brought the wrong lens. It was very lovely. I brought the wrong lens. Perhaps I have a good imagination-I was totally swept away by what I saw in your photos! ...writing. I felt like I wanted to be there as I read to the end. Ooh, that sounds/looks like a nice evening. Yay for an unexpected awesome experience. Yay! That sounds like a lot of fun, and your photos are pretty. I'm so glad we weren't defeated by the rain! 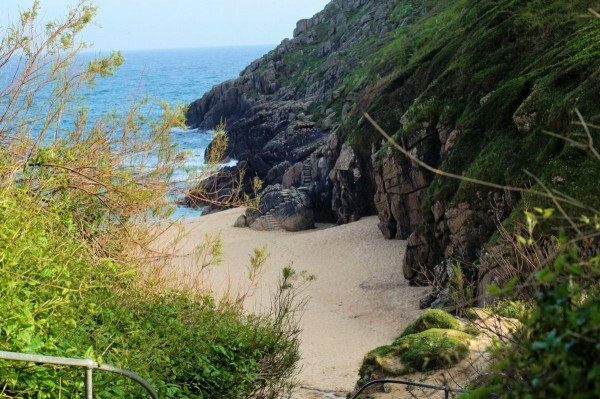 Spent many a wonderful time down at the Minack - I live near St Ives, whereabouts do you live? Over in the Tamar Valley - it's a bit more of a trek for me down to the Western end of the county, so first time we have made it to the Minack.